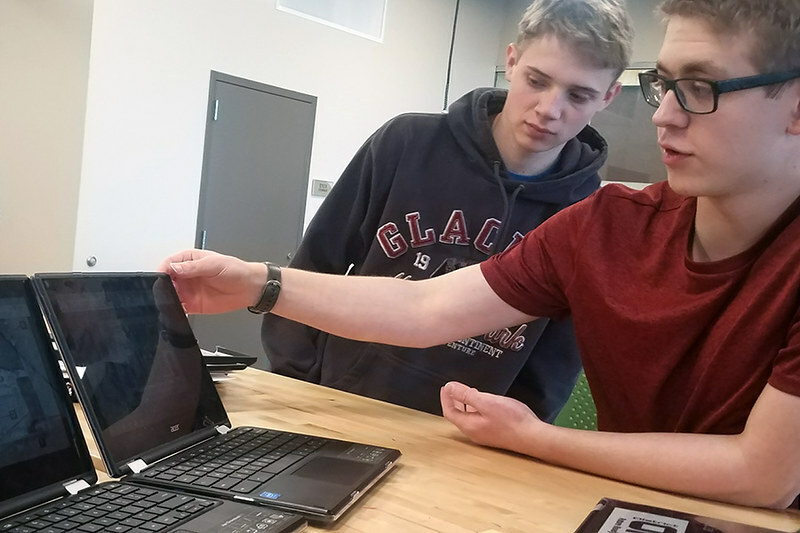 A group of design engineering students at Burnsville High School are working to design a new protective case for the Chromebooks that are issued to all students and staff in District 191’s secondary schools. The idea comes after a school wide survey showed that the majority of BHS students are not satisfied with the cases currently issued with the district’s Chromebooks. Students have noted that the cases have a tendency to crack easily, failing to protect the Chromebooks. Holtzleiter is one of four BHS students in the design engineering class working on this project, along with Zachary Matthews, Tim Johnson and Raymond Kwong. The group is working together with Acer, the manufacturer of the district-issued Chromebooks, along with District 191’s technology department to build a case that is more robust than the existing cases given to students and staff. The project entails coming up with the problem on their own and going through both digital and physical sketches and modeling to develop a viable solution to the problem. The group is expecting this project to go through most of the school year, and they hope to build a prototype of their solution within the next few months. “They're practicing the skills and gaining the knowledge that they'll need in the future if they pursue careers in engineering,” Patrie said.